P94 Do healthcare professionals have sufficient knowledge of inhaler techniques in order to educate their patients effectively in their use? Introduction and objectives Inhalers are widely used in the treatment of asthma and chronic obstructive pulmonary disease (COPD). For patients to gain maximum benefit they need to be educated by competent healthcare professionals (HCPs) whose own competence meets accepted standards. This study looked at HCPs ability to use the commonly prescribed metered dose inhaler (pMDI). Results Of the 150 HCPs assessed only 11 (7%) could demonstrate all the recognised steps in administration including assessment of inspiratory flow using the in-check device (Abstract P94 Figure 1). 113 (75%) of the HCPs said they were involved in the teaching of inhaler technique. Of these 113, 11(9%) could demonstrate all the recognised Steps (n=10 PCT n=1 acute trust). Of the 150, 72 (48%) were prescribers or were involved in prescribing. 94 (63%) had received some training on Inhaler technique in the past of which 64 (67%) said the training took place more than a year before. 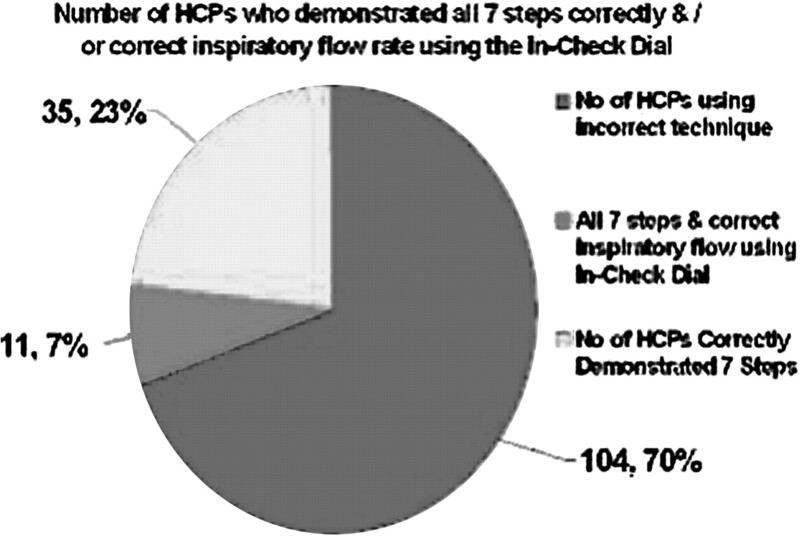 Number of HCP's who demonstrated all 7 steps correctly &/ or correct inspiratory flow rate using the In-Check Dial. Conclusion If we are going to adequately educate our patients with regard to their inhaler usage we as HCPs need to be competent in how each device works. Incorrect teaching and assessment will increase use of healthcare resources, waste medication, and mean worsening symptoms and poor control of airways disease for our patients.